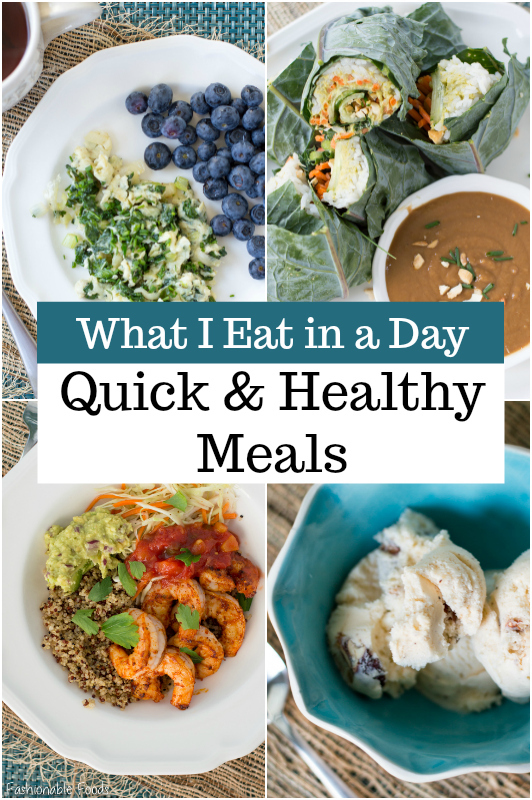 Another look into what I eat in a day! 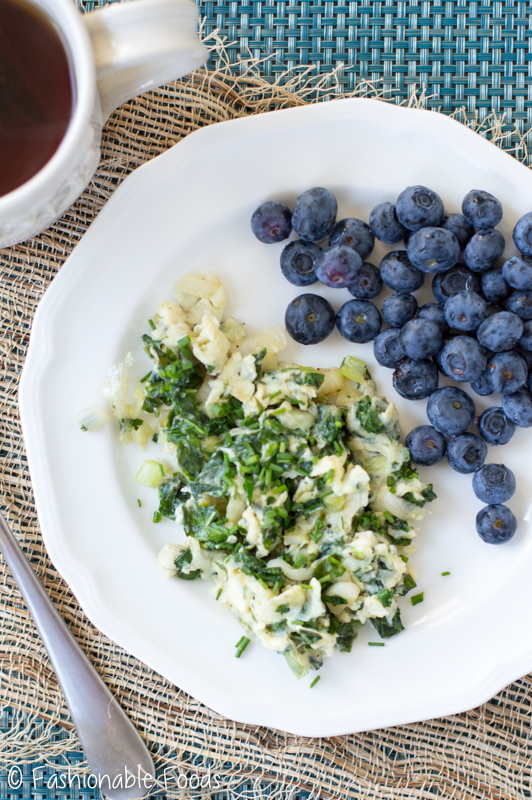 These healthy meals are simple, quick, and delicious! Perfect for busy days when you’re trying to stay on track. You’ll also see that I like to indulge a little in the evening. ? Happy Friday, y’all! Do you have any fun plans this weekend? My parents are coming to visit this weekend, so we will be hanging with them and eating yummy food, of course! I’m back with another “what I eat” post. If you caught my last one, you’ll know that I’m obsessed with watching “What I Eat” videos on YouTube. I suppose you could say I’m pretty nosy and like a peak into what other people eat. It’s good way to get some inspiration for day-to-day eating. As a food blogger, I’m constantly testing new recipes ideas. However, some days are spent sitting at the computer and not in the kitchen. On those days, I like to throw together meals with what I’ve got in the fridge.. and I like to keep things simple, too. As I’ve said before, I’m a savory breakfast fan. I like starting my day heavier on the protein and fat and keeping carbs lower. This works well for me because it keeps me full… and for some reason, I crave carbs more in the evening. I’ve found that if I don’t eat some form of carbohydrates at dinner, I’m typically hungry all night and don’t sleep well. Last month I was all about the omelettes and this month I’m all about the scramble. 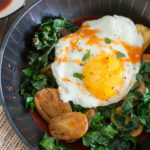 I have a TON of kale in my garden, so I try and incorporate it into as many meals as possible! Lately I’ve been having earl grey tea with my breakfast instead of my usual coffee. I sometimes like to add some almond or coconut milk to the tea, but today I just had it plain. Breakfast kept me pretty full this morning. I ate around 7am and didn’t get hungry until 11:30am. I wasn’t ready to make lunch yet, so I grabbed some grapes and a raw nut mix. Simple, healthy, and delicious! 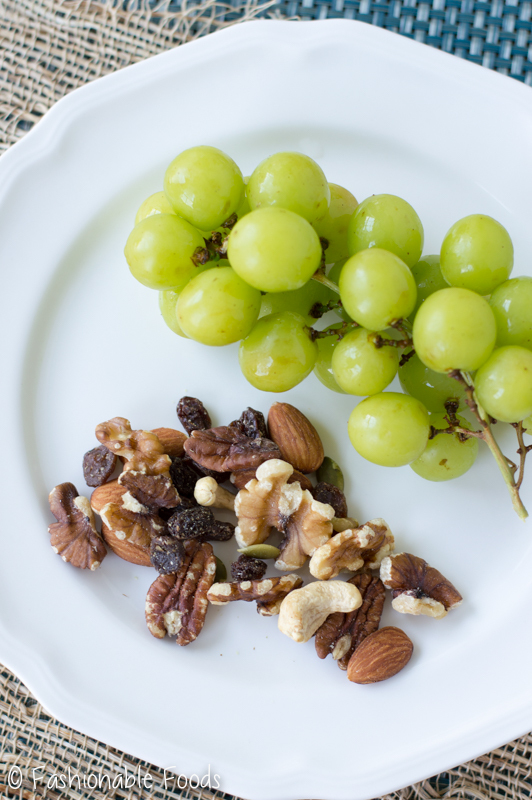 Tip: when eating fruit as a snack, pair it with some nuts (or other fat source). This allows your body to absorb any fat soluble vitamins in the fruit, plus it helps keep your glucose levels more balanced. These kale wraps are one of my new favorite lunches! They are inspired by this recipe, but made with what I had on hand. I made 3 wraps… using 2 kale leaves per wrap, overlapping them slightly. The kale leaves weren’t big enough to use 1 per wrap, so using 2 gives you more surface area. 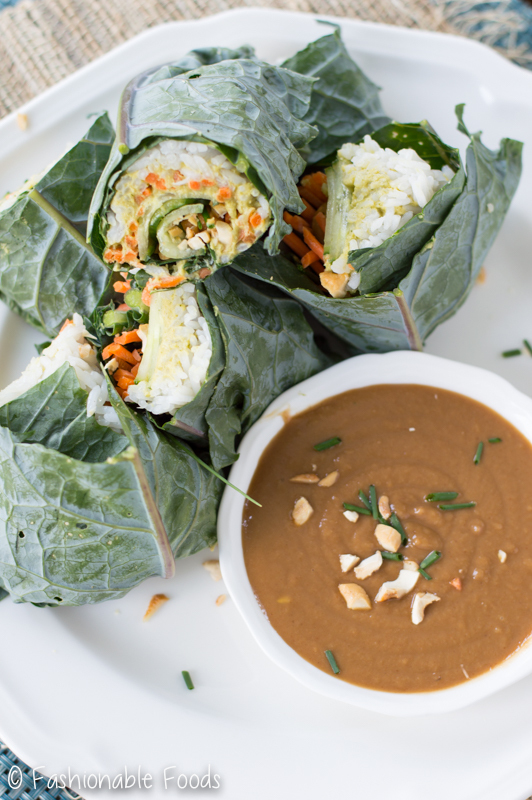 Just pile in the fillings, wrap, and dunk in the peanut sauce! SO GOOD. I had lunch around 2pm, so I skipped an afternoon snack since I wasn’t hungry and went right to dinner at around 6pm. These quick shrimp taco bowls were so simple, but so delicious! Season the shrimp with your seasoning and sauce them until cooked through, about 3 minutes. 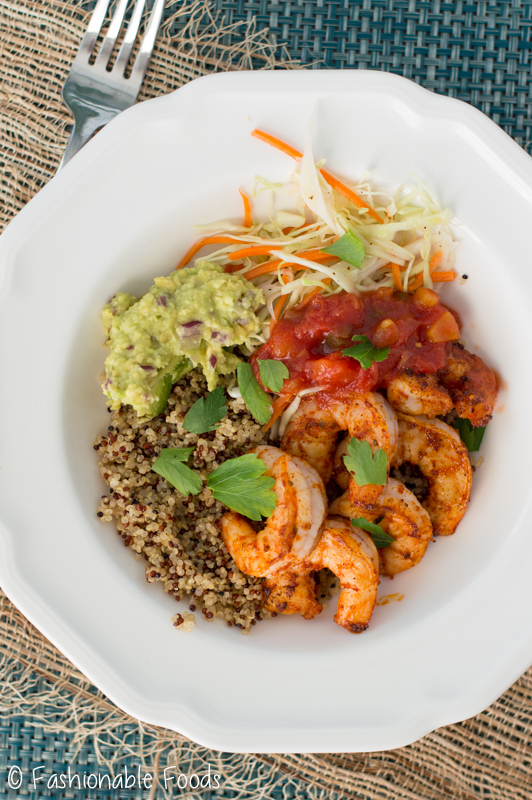 Serve over quinoa and top with the cabbage, salsa, and guacamole. SO easy, yet so good! Plus, you can really top them however you like. Since it’s been so hot out, we’ve been sitting out on our front porch in the evenings once it cools down. 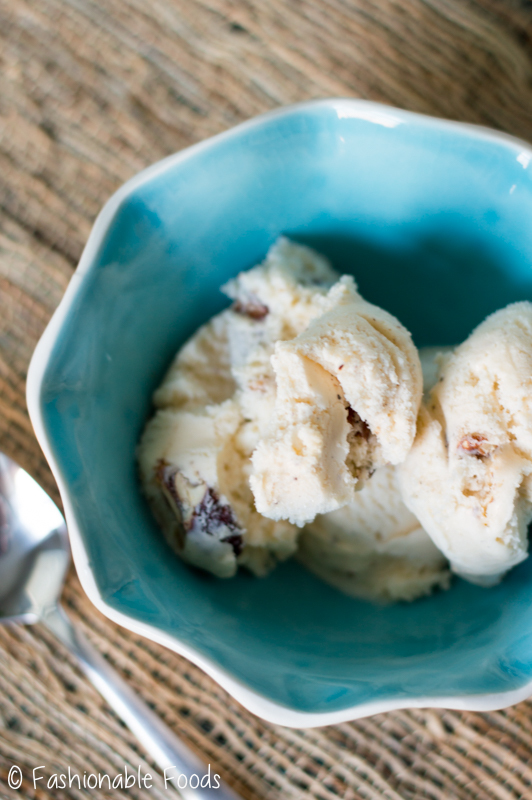 I was in the mood for some ice cream, so I enjoyed a small bowl of butter pecan. We all need some indulgence every now and then, right?! Truth be told, I eat a lot of ice cream throughout the summer… because why not? Actually, I eat a lot of ice cream all year round because I simply just love ice cream. ? On that note, I hope you enjoyed this edition of “What I Eat”… and have a great weekend! This was such a fun post! 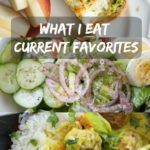 I love the idea of writing a “What I Eat” post. I’m the exact same way about reading/hearing about what other people eat. My favorite thing to ask people is “What did you make for dinners this week?” I love that I’m not the only one that’s like that! It must be a quality of people who love cooking. Your meals this day were SUPER legit!! Way more legit than mine…I had three frozen waffles for breakfast and haven’t had any snacks or lunch yet. Yikes. Maybe you’ll be my inspiration :)! I always need new healthy recipe ideas Keri. I tend to find something I like then I eat it over and over and over again. Loving these Kale Wraps, I just can’t get enough kale in my life. WOW, I like always healthy and delicious food recipe. You share all of your blog healthy and delicious food recipe. Thank you for share such post. It’s really helpful for the people. This is a really great food recipe. Your tip is very helpful for the people. Thank you for share a helpful tip. Your post is really inspiring! I wanna try this someday. Thanks for sharing this! Great job! Nice article… For a healthy life healthy food is must but sometime we are in hurry so we eat unhealthy food which is not good for our health. From this article you give good knowledge for eat healthy meal in hurry. These Recipes are most Favorite recipes of all time, Keep up doing the great work. Hope you will find yourself more healthy by time goes.